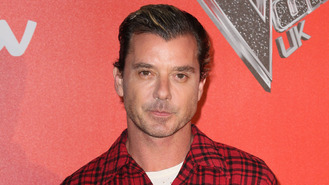 Gavin Rossdale is in awe of how “amazing” ex-wife Gwen Stefani is on The Voice U.S. The British rocker is a new addition to the U.K. version of the hit show, joining fellow newcomer Jennifer Hudson and regulars Tom Jones and will.i.am in judging hopeful singers’ talent on ITV1. His former spouse Gwen sits on the panel Stateside and apparently had nothing but best wishes for Gavin upon his casting. Gavin, 51, is happy to be back in the U.K. as he’ll be able to catch up with friends and family, including model daughter Daisy Lowe. He also hopes his kids with Gwen, sons Kingston, 10, eight-year-old Zuma and Apollo, two, will one day tune into their dad on the small screen. Joking he was “useless” when the series kicked off as it was his debut on the show, the Bush frontman has now realised the fit comes “naturally” when it comes to picking a contestant to guide to success. Matt Willis won't be bringing his kids on Busted's forthcoming 'Night Driver Tour'. Late music legend David Bowie and pop diva Rihanna are the top contenders at the 2017 Brit Awards. Prince performed secret charity work in every city he performed in, according to his ex-wife Manuela Testolini. Ed Sheeran has smashed yet another chart record with his two new singles officially reaching number one and number two. Jon Bon Jovi couldn't even sing in the shower after his band's 2013 tour, which saw the departure of guitarist Richie Sambora. Ed Sheeran says the only song he wishes he kept for himself is one he wrote for Tori Kelly's album. Taylor Swift teased her video with Zayn Malik as she wished the former One Direction star a happy birthday on Thursday (12Jan17). Madonna will march for women's rights in Washington, D.C. next week (21Jan17). Singer Robin Thicke and his ex-wife have gone back to court for a bitter new custody battle over their six-year-old son.